It's spring in Melbourne and that always puts a smile on my face! Unfortunately though we've already suffered terrible bushfires; the downside to our lovely warm weather. But on a lighter note, spring also means something else: the Melbourne Marathon is run in October each year. You may recall that earlier in the year I set a goal. I promised myself - and everyone around me who would listen - that I would run at least two half marathons over the coming twelve months. Well, here we are, two days before the first of those. Despite my training being interrupted by a debilitating bout of hayfever and several hamstring injuries, I'm about as ready as I'll ever be. 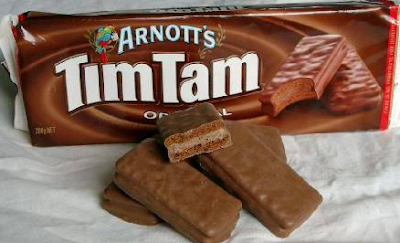 Some days I feel like I should just age gracefully and stay on the couch with a packet of Tim Tams. I also pledged to fund raise for Wildlife Victoria - a cause I feel very strongly about, particularly as we head into what promises to be a very hot, dry summer. I'm excited to say that I have managed, thanks to the generosity of supportive friends, to raise over $700! I'm not embarrassed to put my fund raiser page up here and suggest you might like to ... hmm ... help me get to $1,000?! So here it is ... Karen Turner for Wildlife Victoria. So, after a little diversion, I'm back to today's topic, which is about goal setting and how you can find the discipline to put yourself in the best position to achieve your goals. It's actually simpler than you may think. I know with my writing, having a deadline is one of the best ways to make sure I keep on track, but being accountable to someone other than yourself is the big one. As you'll know, I'm busy writing the third book in my Broughton Hall series and with so much else going on in my little corner of the world, it would be easy to slack off a bit. Fortunately for me, so many of you regularly ask when the next book is coming out; it's terrific and really keeps me on my toes. I dare not slack off! Similarly to my training for the half marathon, especially after days and days of hayfever and the lack of energy and horrible feeling that comes with it, so many mornings I rolled over in bed, way too tired to even think of putting on running shoes. It would have been so easy to call it a bad idea and forget all about running 21ks. But there were people supporting, donating their money to my chosen charity - I owed it to them, I was accountable to them. So here we are, two days away and I'm fit and ready to go. That's the thing about goals. Setting them is the first step, applying a deadline is next, and finally being accountable. It's the same with writing, quitting smoking, saving for something, any goal you want to achieve. For my next book, my goal is to have the first draft ready for review (Specific & Measurable) by next November (Achievable, Relevant and Time bound). That means, I'm on track for the final book in the trilogy of Broughton Hall, I know what I have set to achieve, how it will be measured so I know I've achieved it, and by when. And my half marathon? My goal is in sight and I'm looking forward to it, knowing that with the support of my generous friends I will have helped my fave charity. Now, before I forget, here's a link to an article that appeared in the Mornington Peninsula Magazine about yours truly! Hope you enjoy. Australia's favourite biscuit - Arnott's Tim Tams.